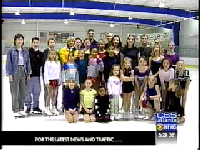 Some of our skaters wished "Good Morning Atlanta" to the CBS viewers on March 28, 2002. You can click on the photo to view the video on Youtube. The Georgia Figure Skating Club has new Club Jackets for 2010! We have the order forms ready for the club jackets. Just click here for info and the forms. You are new to figure skating, or your son or daughter is new to the sport. And, you want to know how this all works?